Former Tampa Bay Buccaneers and Oakland Raiders defensive tackle Warren Sapp is in his fourth season with NFL Network. This season, he serves as an analyst on NFL Total Access and the Emmy-nominated NFL GameDay Morning. Aside from his work on NFL Network, Sapp is a regular on Inside the NFL on Showtime. In 2008, Sapp appeared as a contestant on ABC’s seventh season of Dancing with the Stars where he finished in second place. Sapp, who retired from the NFL in 2008 after a 13-year career, is a seven-time Pro Bowl selection who ranks second among all defensive tackles with 96.5 career sacks. 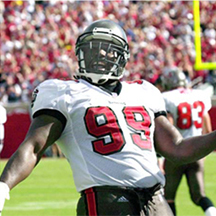 In 1999, Sapp was named Associated Press Defensive Player of the Year after posting 12.5 sacks and anchoring a Buccaneers defense which allowed the fewest points and fewest yards in the NFC. One year later, Sapp posted a career-high 16.5 sacks. In 2002, Sapp helped Tampa Bay to its first title in franchise history with a 48-21 victory over Oakland in Super Bowl XXXVII. The 2002 Buccaneers defense topped the NFL in points and yards allowed. Selected to the NFL All-Decade Team for the 1990s, Sapp was a standout at the University of Miami, where he won the Lombardi Award in 1994 which annually recognizes the nation’s best lineman in college football.